As a passionate advocate for animals and devoted dog guardian, Tracey Wade helps the BC SPCA as a volunteer, fundraiser, and donor. Her genuine commitment to animal welfare shines through, and has inspired many others to join her in working to help animals in need across B.C. As Gala Chair for the BC SPCA’s Offleashed Gala in Vancouver for the past two years, Tracey has donated a tremendous amount of time and effort to raise funds and awareness for the BC SPCA’s work. In this role, she leads planning for the event and invites friends to join her at the event as both guests, volunteers and sponsors. She works tirelessly to bring animal lovers to Offleashed so they can learn more about the BC SPCA and be inspired to give. Under her leadership the gala has been a phenomenal success, with this year’s Offleashed raising a record-setting $500,000! 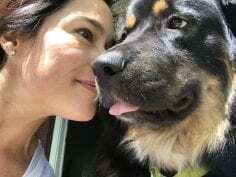 Tracey’s connection to the BC SPCA is quite personal as well: she and her husband Brooke adopted their dog Guinness from the BC SPCA this year. Several months after they lost their beloved Ben the Dog in 2016, a picture from the BC SPCA flashed across her computer screen of a dog from up north who needed a home. “I knew I had to ask about him,” says Tracey. “He was in the Quesnel branch, and the wonderful staff there took time to speak with me about him. Then the staff put the wheels in motion, literally, bringing him down to Vancouver through the Drive for Lives program. Brooke and I met him, and the rest is history!” Tracey and Brooke support the BC SPCA as gala sponsors and through donations to ensure that other animals like Guinness get the lifesaving help they need. On behalf of the thousands of animals in need you are helping, thank you, Tracey! Learn more about the Offleashed Gala.